To order a printed copy of the Natures Best Supplements catalogue, simply click the Request button below. Nature's Best have been supplying high quality Vitamins, Mineral supplements and Herbs for 35 years. All Nature's Best products are manufactured in the UK to stringent pharmaceutical standards of Good Manufacturing Practice (GMP) and approved by the UK Department of Health - health and quality you can trust to last. 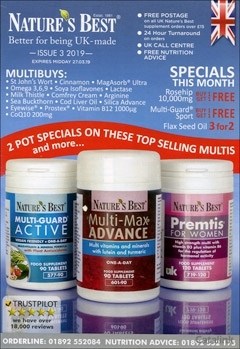 Order the Nature's Best catalogue above to get the most from your body - whatever you need. Natures Best Supplements Catalogue Celia B. said: Keeping brochure for future ref. Natures Best Supplements Catalogue Lynette M. said: I love all the products, but will wait until I find the essential one I need before making a purchase. It looks like I will love them all though! By pressing the Request Printed Catalogue button you give consent to Natures Best Supplements (and their Data Processors for the specific purpose of delivering your literature) to send you their Catalogue.